TORONTO, April 17 /CNW/ - As the Internet has enabled consumers to manage important aspects of their personal lives from the relative comfort of their home, it is no surprise that Canadians are becoming increasingly intrigued by the prospect of being able to view and manage their health information using emerging personal health records (PHR) technologies. Recent announcements by major players in the IT industry suggest such capabilities are just around the corner. Recognizing developments in this area are moving quickly, Canada's federal, provincial and territorial health ministries have expressed support for Canada Health Infoway's (Infoway) plan to discuss personal health record solutions with interested vendors and to explore how these technologies could be made available to Canadians in a secure manner. "Providing Canadians and their health care providers with appropriate and secure access to their health information has been our goal from the onset," said Richard Alvarez, President and CEO of Canada Health Infoway, the federally-funded, independent, not-for-profit organization that is leading the adoption of electronic health records across Canada. "The prospect of seeing consumer health solutions in the Canadian marketplace is an exciting development indeed. It is also critical that we ensure these offerings provide the appropriate level of trust, protecting the privacy and security of Canadians' health information." "The Government of Canada, through its funding of Infoway, is investing in the national transition from paper to electronic health records," said the Honourable Tony Clement, Federal Minister of Health. "I am pleased that personal health record solutions will complement and leverage our investments to date in e-health solutions. With the appropriate ground work in place, PHR's will ultimately deliver greater value to Canadian patients." "Canadians are taking increasingly active roles in managing their chronic diseases and preventing illness from setting in," said Chris d'Entremont, Minister of Health for Nova Scotia, who serves as the liaison minister between Infoway and federal, provincial and territorial health ministers. "Our investments in the implementation of electronic health records are crucial to our goal of ensuring Canadians have access to the information and tools they need to manage their care. The onset of personal health record solutions can accelerate our desire to enable patients to have these capabilities." A number of technology vendors have expressed interest in creating solutions that will equip Canadians with the technology they need to view their medical data. Working with Infoway and its partners will help ensure the solutions available to Canadians will leverage the progress made in implementing electronic health record projects across Canada. Using technology solutions that are compatible with Infoway's blueprint will ensure patient privacy and security provisions are adhered to. Infoway has funded 249 electronic health record projects across Canada to date. 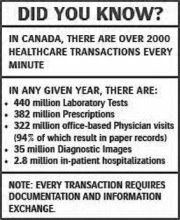 These secure systems are leading the pan-Canadian switch from inefficient paper-based storage of medical data such as lab test results,prescription history and allergy information to electronic systems that are far more efficient, save money, and save lives. 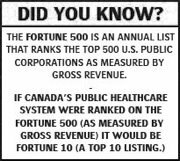 Canada Health Infoway is an independent, not-for-profit organization funded by the Federal government. Infoway jointly invests with every province and territory to accelerate the development and adoption of electronic health record projects in Canada. Fully respecting patient confidentiality, these secure systems will provide clinicians and patients with the information they need to better support safe care decisions and manage their own health. Accessing this vital information quickly will help foster a more modern and sustainable health care system for all Canadians.